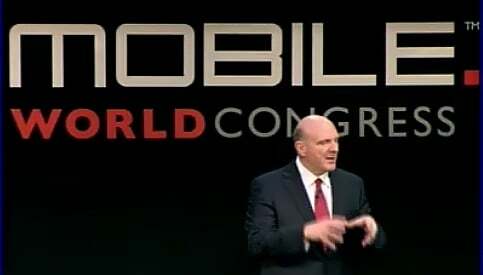 While many didn't expect much from Microsoft's Keynote Address at the 2011 Mobile World Congress, Steve Ballmer and company did find a way to surprise us. While the first part of the presentation was a re-cap of the progress Windows Phone 7 has made, the Microsoft CEO also touched on how well the new phones are being recieved by consumers. Nine out of ten Windows Phone users would recommend the phones to other and many feel that Windows Phone 7 is the easiest and most delightful to use. Building phones that people love and that are operator friendly is the top priority at Microsoft. Ballmer also mentioned that the first update for Windows Phone 7 is only a few weeks away, being release in March and will include the copy/paste feature and overall performance enhancements. No surprises there. But what was of some surprise is what's heading to Windows Phone 7 later this year. 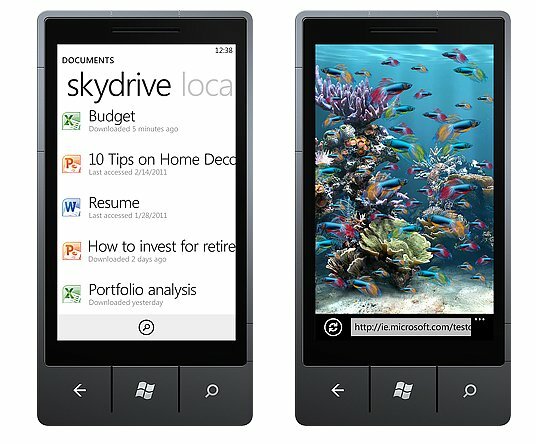 Here's a break down of the three major features in development for Windows Phone 7. Internet Explorer 9: Internet Explorer 9 is heading to Windows Phone 7 and the demo presented by Joe Bellifoire was impressive. You will see HTML 5 support and hardware acceleration. IE9 will use the same engines on both the PC and Windows Phone to allow for better consistency in operation and development. It will also make use of hardware acceleration to improve the overall user experience. Multi-Tasking: We've already touched on this but sometime in 2011 we'll see a more traditional multi-tasking ability come to Windows Phone 7. Multi-tasking that will let you resume apps instantly and that will bring a Task Switching View (e.g. Task Manager) that will allow for you to switch easily between apps. Microsoft hopes to bring a balance between protecting your phone's battery and having the ability to easily switch between apps. There was also mention of Twitter and Kinect integration with future updates. They didn't expand much on the Twitter aspect beyond saying it would be integrated into the People Hub. But the Kinect integration looked interesting. This would turn your Windows Phone 7 device into a companion for the Kinect. In the video demonstration of this feature, the Windows Phone becomes a controller of sorts for the Kinect games. It turns a game of dodge ball into a two person game where you launch the balls from your Windows Phone and you opponent dodges them via the Kinect. Nokia's CEO, Steve Elop, also made a cameo during the presentation to re-cap the events from the past few days concerning the Microsoft/Nokia partnership. He re-affirmed Nokia's commitment to provide the best ecosystem possible and that the partnership with Microsoft is a balance. Ballmer commented that scale and variety will help Windows Phones to thrive but also recognized that fragmentation, that is plaguing other platforms, will make the system suffer. As always, Ballmer hinted that there was more to come with Windows Phone 7 updates. The one thing that struck me from the presentation is that Windows Phone 7 is a work in progress. Progress that Microsoft and its partners are making in careful, strategic steps in hopes of providing a competitive platform.